The Hostel is located in Berlin Mitte, which is right in the center of the city. Most of the old Berlin is located here. After the Berlin Wall came down the former center of East Berlin was rebuild and the new Berlin city - the Potsdamer Platz, which together with the Alexanderplatz was the centre of the nightlife in the 1920's was ‘re-invented’. We are in the northern part of the inner city, very close to Oranienburger Strasse, a few minutes away from Hackescher Markt and Friedrichstrasse. 10 minutes walking south and southeast you'll get to museums island with the National Gallery, Old Museum, Berlin ‘Dome’ Cathedral, Pergamon Museum, Humboldt University and to famous “Unter den Linden” - the main street from Alexanderplatz to the Brandenburg Gate. Crossing “Unter den Linden” you'll get to gendarmenmrkt and even more sights until you get to Checkpoint Charlie - maybe a 20 minutes walk from the hostel. If you leave the hostel heading west, you'll find yourself passing a few modern governmental office-buildings until you get to the Reichstag and the Brandenburg Gate. Passing the Tiergarten and Victory Column - the ‘Siegessäule’ - you'll reach the Potsdamer Platz, Berlin Philharmonic Hall, New Museum and the Kulturforum with all the Old Masters. Almost all sights are within walking distance. The Nightlife of Berlin is widely spread over the different districts. Kreuzberg, Friedrichshain, Prenzlauer Berg and Mitte are full of Clubs and Bars, small Cafes, independent cinemas, theatres and all sorts of multi-cultural venues far away from main stream ‘entertainment’. Just around the corner of the Hostel you'll find the famous Oranienburger Strasse and its neighborhood with heaps of smaller clubs and bars, restaurants and cafes, asian, turkish, italian, spanish and last but not least german fast food - the ‘Currywurst’. At the corner Friedrichstrasse you'll find the ‘Tacheles’ - the trash-art house, where international independent artists live and work in a unique environment. But you don't even have to leave the hostel to have a party, upstairs in our common room you can socialize 24 hours a day, the bar is open and you can check out the club downstairs - the well known berlin club ‘Kalkscheune’. 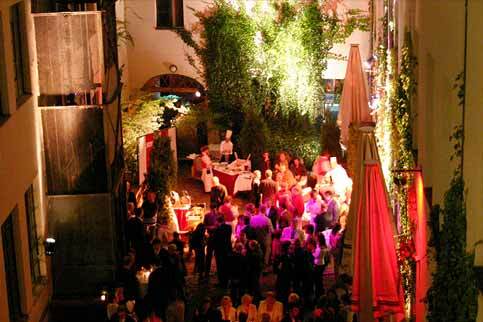 Parties and live music, as well as readings and flamenco nights make it a real interesting location in the heart of berlin.